Sherry Pfister, a retiree who once worked at the Palo Verde nuclear power plant 45 miles west of Phoenix, says she didn’t hesitate to lease solar panels for her home in Waddell, Ariz., and says the panels have cut her utility bill by a third. “Why isn’t everybody doing it?” she wonders. As the video above shows, that new world of decoupled growth and electricity began in the 1970s. But Utility Executives have never been hired to be forward thinking. Perhaps that will change sometime soon.. When customers of American Electric Power Co. AEP +2.69% started dialing back on power consumption in early 2009, company executives figured consumers and businesses were just pinching pennies because of the recession. Five years and an economic recovery later, electricity sales at the Columbus, Ohio-based power company still haven’t rebounded to the peak reached in 2008. As a result, executives have had to abandon their century-old assumption that the use of electricity tracks overall economic conditions. Utility executives across the country are reaching the same conclusion. Even though Americans are plugging in more gadgets than ever and the unemployment rate had dropped at one point to a level last reported in 2008, electricity sales are looking anemic for the seventh year in a row. 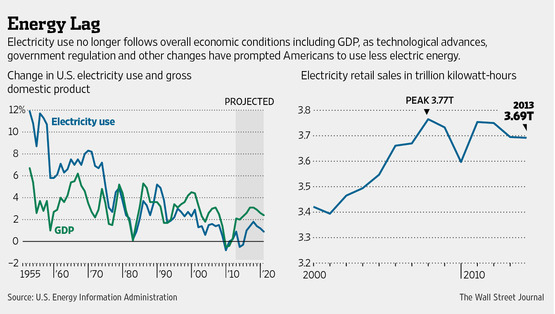 Sluggish electricity demand reflects broad changes in the overall economy, the effects of government regulation and technological changes that have made it easier for Americans to trim their power consumption. But the confluence of these trends presents utilities with an almost unprecedented challenge: how to cope with rising costs when sales of their main product have stopped growing. Sales volume matters because the power business ranks as the nation’s most capital-intensive industry. When utilities are flush with cash, they buy lots of expensive equipment and raise dividends for investors. When they’re selling less of their product, they look for ways to cut or defer spending. Regulators typically allow utilities to charge rates that are high enough to cover their basic expenses, but that doesn’t guarantee them strong profits. Utilities typically need to expand sales volume by 1% or more a year just to maintain their expensive, sprawling networks of power plants, transmission lines and substations, says Steven Piper, an energy analyst for SNL Energy, a research company. “That’s where the existential crisis is coming from,” he adds. Existential is right. It’s a bit surreal that these guys have been so slow on the uptake. This (relatively) recent AP article gives a hint why things are so dire. NEW YORK (AP) — The average amount of electricity consumed in U.S. homes has fallen to levels last seen more than a decade ago, back when the smartest device in people’s pockets was a Palm pilot and anyone talking about a tablet was probably an archaeologist or a preacher. Because of more energy-efficient housing, appliances and gadgets, power usage is on track to decline in 2013 for the third year in a row, to 10,819 kilowatt-hours per household, according to the Energy Information Administration. That’s the lowest level since 2001, when households averaged 10,535 kwh. And the drop has occurred even though our lives are more electrified. Here’s a look at what has changed since the last time consumption was so low. In the early 2000s, as energy prices rose, more states adopted or toughened building codes to force builders to better seal homes so heat or air-conditioned air doesn’t seep out so fast. That means newer homes waste less energy. Also, insulated windows and other building technologies have dropped in price, making retrofits of existing homes more affordable. In the wake of the financial crisis, billions of dollars in Recovery Act funding was directed toward home-efficiency programs. Big appliances such as refrigerators and air conditioners have gotten more efficient thanks to federal energy standards that get stricter ever few years as technology evolves. A typical room air conditioner — one of the biggest power hogs in the home — uses 20 percent less electricity per hour of full operation than it did in 2001, according to the Association of Home Appliance Manufacturers. There’s no way to achieve a 100% elimination in anything near a reasonable time frame in a growing world economy AND keep that economy functional. How can we know this, when we don’t even know the basic math? We don’t even know how much it will cost to build the new infrastructure we need. You would think that after twenty years of talking about AGW, arguing about laws of physics with deniers, getting all fired up about rooftop solar, that someone, somewhere, might actually be interested in finding out how much it will actually cost to get off of fossil fuels? Because we do have some idea how much it will cost if we DON’T get off fossil fuels – $1240 trillion by year 2100. After which, of course, it REALLY starts to get expensive! So, how do you know that our economy can not be functional without fossil fuels? Right now, the cost of energy to our economy is enormous. Individuals and industry are paying a minimum of $1.2 trillion out of their own pockets for fossil fuels. What if we built anew Federal utility, that made only electricity from renewable sources, and then charged next to nothing for it? Do you think our economy might be more functional or less functional if we now had $1.2 trillion dollars every year to spend on something besides fossil fuel? My guess – our economy would not suffer at all. Jacobson and Delucci just published a new paper (http://web.stanford.edu/group/efmh/jacobson/Articles/I/CaliforniaWWS.pdf) on how much it would cost to build all the new renewable energy infrastructure California would need to be completely fossil fuel free by year 2050. They said it would cost California about $1.1 trillion dollars. And, they said that $1.1 trillion would be cost neutral – savings to the state from reduced expenditures due to the hazards of fossil fuels would pretty much pay for that investment. California is a big state – it represents a sizable proportion of our national energy needs. Based on that, we have some general idea how much it COULD cost to dump fossil fuels. And the economics look pretty darned rosy – IF we approach new energy infrastructure as a public, not a private venture. I think economies that stay with fossil fuels are headed for trouble. The EROI is low and the net effect on the economy of chasing ever more scarce FF is to drag it down. Economies that utilize renewables flourish. « Is Climate Change Awakening a Methane Monster?